Looking for ways to make your garden a little more fun? Make it magical with miniatures! 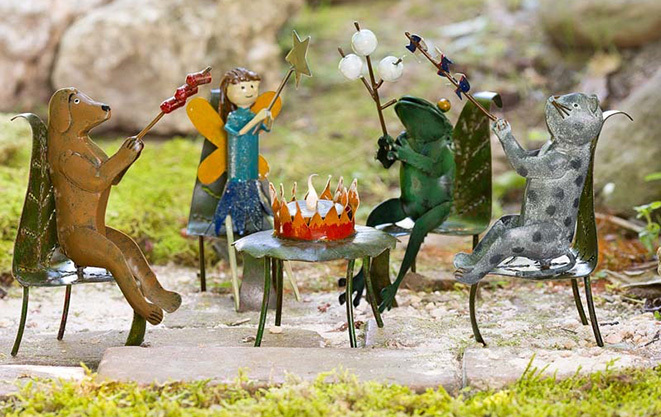 Fairy gardening is a delightful way to add whimsy and wonder to your landscape. And, let’s be honest: it’s an acceptable way for grownups to play. Fairy gardening can happen anywhere, from an existing garden spot outdoors to an outdoor raised garden bed or a large indoor planter. Let’s explore some ways to get started on an enchanting journey! 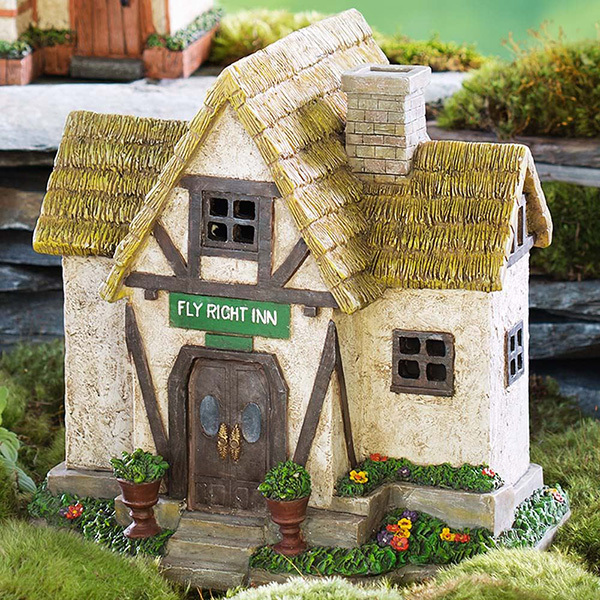 If you’re only ready to dip the tip of your wing into the world of fairies, accessorizing a current garden spot is a good place to start. 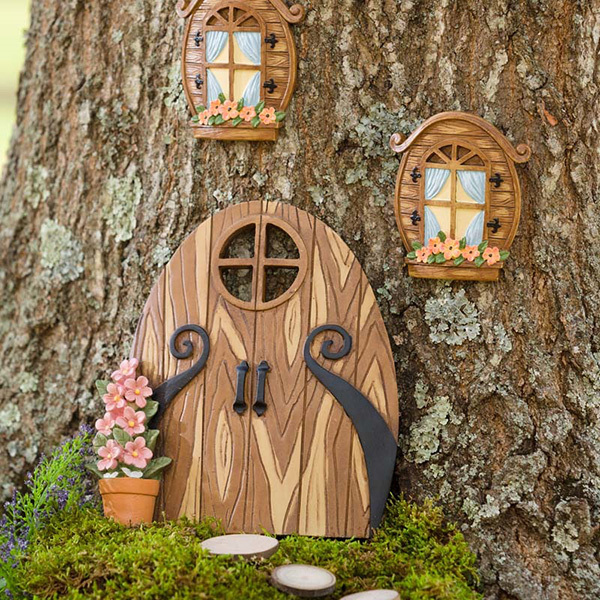 Dress up an existing pathway or mossy area with a fairy house and furniture, or add an unexpected fairy door to a tree. Guests and passers-by will smile at the surprise. You can also tuck accessories into full-sized plants and shrubs without changing your existing garden. You can add to your display and change it over time as your collection grows and your fairies’ tastes change. 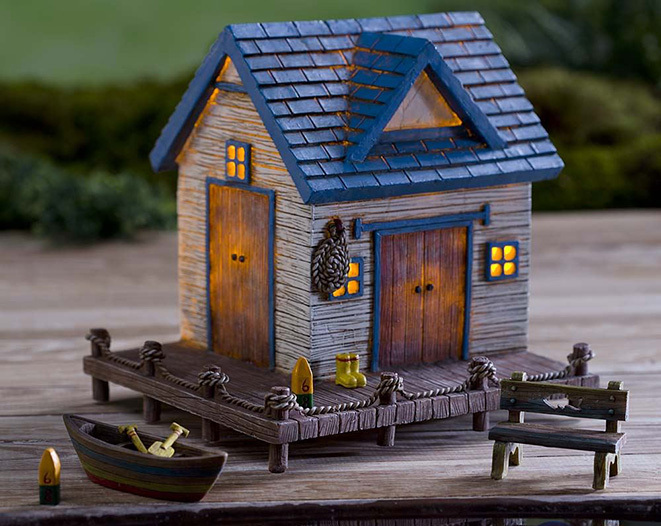 Options range from rustic to fanciful and ornate; there are even solar options for a gentle glow from your fairy garden at dusk. Choose what works in your garden, and wait for the magic to happen. 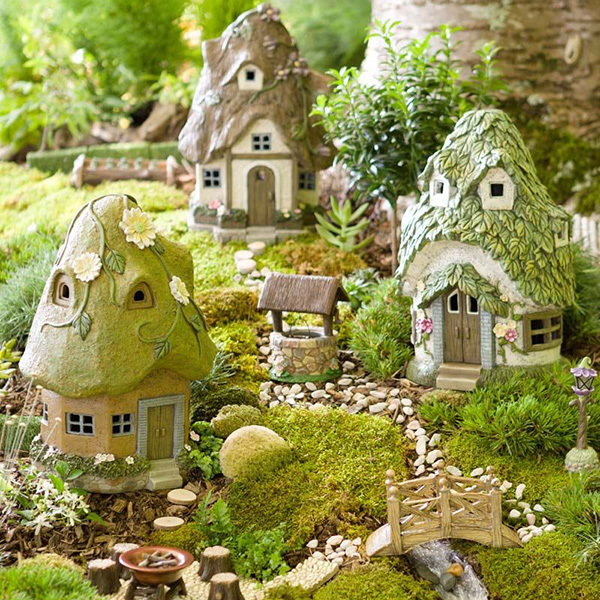 A raised bed can be an ideal way to start your fairy garden. Raised beds take the strain out of any type of gardening because they eliminate the bending, stooping, and kneeling that make gardening a challenge for some. They also create a convenient, contained space for the garden and make your miniatures more visible. Want some tips on how to make it just right? 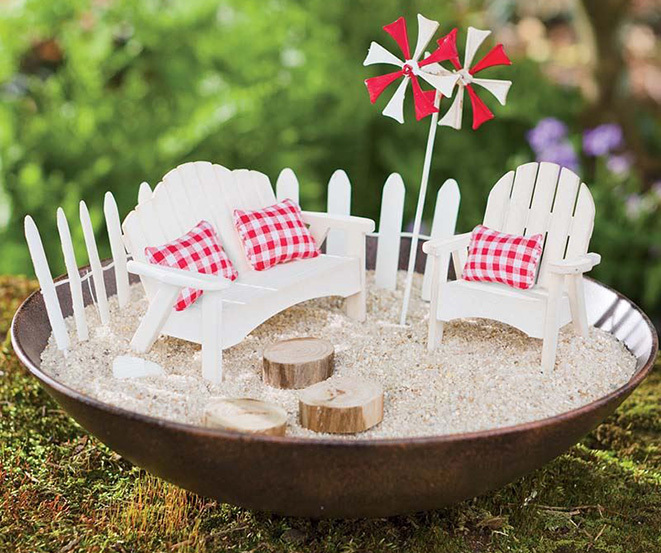 Watch Plow & Hearth’s photo stylist create a raised bed fairy garden. You can create your fairy garden in a container as well. Use any generously sized planter to create your little scene indoors or out. 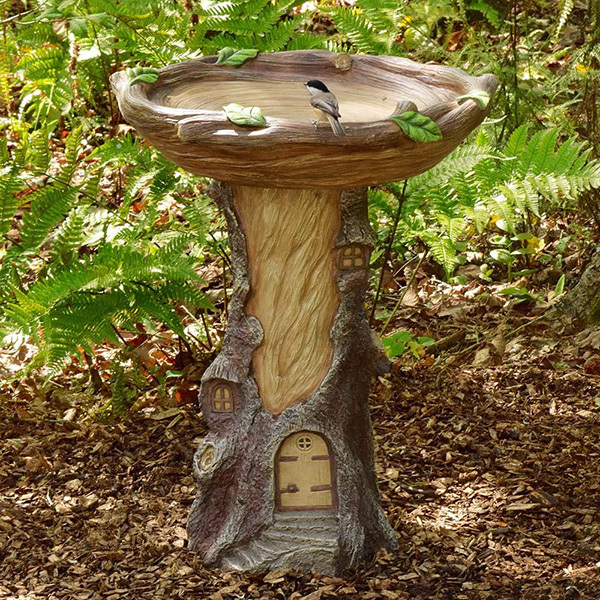 A birdbath makes a great fairy garden container, and it has the advantage of being raised so visitors can easily see the charming contents within. 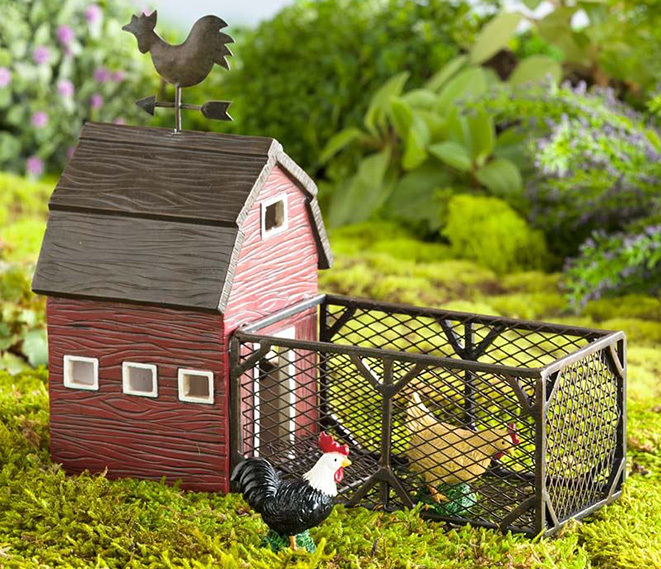 A terrarium, tub, or vintage wheelbarrow can also add unique personality to a fairy garden. Now, no one has ever seen fairies, as they are very elusive creatures. But we do know that they are attracted to magical spaces, so here are some tips to make yours a place a fairy family would want to frequent. Build the foundation. Start with good-quality potting soil. Fill the bed and integrate interesting topographical points, such as a hill or two, into your little landscape. Top with real or faux moss, available at garden and craft stores, or use Moss Milkshake to create your own moss in a shade-loving space (it will take about 2-3 months to grow). Mulch can be another, low-maintenance ground cover; you’ll want to use a type that’s finely shredded or in smaller pieces. Select your focal point. Do you want a village with several houses, or a farm with one house and animals? 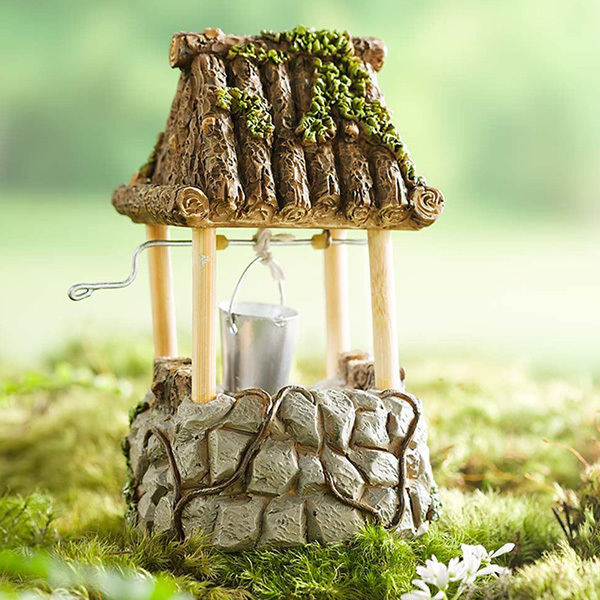 A fairy house can be the star of the show, or let the fairy accents play a supporting role to an existing water feature or favorite garden spot. The possibilities are endless. Add the details. You can create pathways with pea gravel or make patios out of sand with small rocks, shells or tile pieces. Make your own fencing out of sticks or purchase fencing from retailers that sell miniatures. You can even get lawn ornaments, birdbaths and miniature planters for your design. Real, faux or in between? The easiest way to start is with store-bought miniatures, usually made of painted resin. Some dedicated gardeners choose to make their own houses, ladders, tables and more out of “found” objects including sticks, bark, stone, seeds, pine cones and more. An interesting, lichen-covered log could provide great material for any number of fairy accessories. Pinecone petals make great roof shingles. Sticks can make anything from houses to footbridges, fences and chairs. Large clamshells make great fairy pools or ponds. Plant live plants if you wish. Some miniature gardening enthusiasts take their hobby to the next level by using petite plants. You can create a living landscape on a smaller scale using flowering plants, ground cover, miniature bonsai-like trees, and succulents. You can also add herbs and make your fairy garden a kitchen garden! A helpful resource for this hobby is the book Gardening in Miniature by Janit Calvo, considered by many enthusiasts to be the best resource on the subject. Any way you plant it, little things are big fun! Plow & Hearth is a trusted national retailer specializing in unique, enduring home, garden, yard, and lifestyle products that are quality-built and guaranteed to meet their customer's expectations. Whether you browse their catalog, visit them online, or drop into one of their 24 retail locations, you’ll quickly come to understand their guiding principle: treat every customer like a friend and neighbor.